Sometimes simpler is better when it comes to targets for fun shooting and load testing. While we normally use test targets from our Downloadable Target Page, it’s sometimes easier to just use high-visibility adhesive target dots. 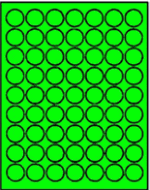 You can order 1″ target dots in bulk from Data-Labels.com. Many colors are available including fluorescent (hi-viz) Red, Green, Orange, and Yellow. These are bright and easy to see even in fading afternoon light. A pack of twenty (20) sheets (1260 dots total) costs just $5.97 (that works out to $4.74 per thousand). For the 1″-diameter stick-on dots you get 63 dots per sheet. Larger, 1 2/3″-diameter fluorescent dots are also available from Data-Labels.com in 20-sheet packs for $5.97, with 24 large dots per sheet (480 dots total). If you want larger, 2″-diameter dots, sheets with 400 Hi-Viz dots are currently on sale for $5.97 per 20-pack. If you prefer smaller, 3/4″-diameter circles, Staples.com sells packs with 1008 adhesive dots for $3.64 to $8.39 per pack. Colors include Neon Red (item 538041), Neon Orange (item 538116), Neon Yellow (item 538090), and Neon Green (item 538066), as well as dark blue, light blue, yellow, and dark green. We recommend the Neon Red for most uses, or the Neon Yellow for use on a black background. For $4.41 Staples sells a “Rainbow Pack” (item 297705) with four assorted colors: red, light blue, green, and yellow. For close-range work, you may prefer 1/2″-diameter dots. Forum member Steve has found these at Uline.com. 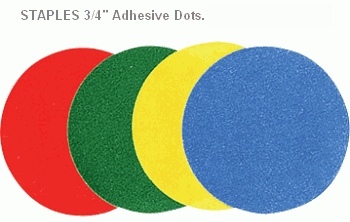 The 1/2″ dots are available in a wide variety of colors including fluorescent Red, Pink, Yellow, and Green. Price is $12 for a roll of 1000 dots (item S-2063). Share the post "Day-Glo (Hi-Viz) Target Dots Starting at Five Bucks per Thousand"
I prefer 1/2″ circles, like these from Uline ( http://www.uline.com/Browse_Listing_1215.asp?desc=Inventory+Labels+%2D+Blank+Circles ) which cost more, but are smaller. A 1/2″ circle at 300 yards (longest range available near me) is not quite entirely covered by nightforce crosshairs at 42-power (I’d say 70% coverage). I.e., it seems easier to line up repeatedly than with the bigger (3/4″) circles, which I used to use. Note that, for me, neon green and neon orange work best on brown cardboard targets. Neon orange works well on white paper. This data-labels route is a good find for cheap dots! I use 1″X3″ labels and cut them into thirds. This gives me 1″ squares. When shooting I place the crosshairs on one of the corners, less guessing. Ordered some of the 1″ dots from datalabels.com (which is now label outfitters.com) recieved them in two days Priority mail! Bought the flourescent red,green, and yellow and they are really nice especially for the price. Be aware that sometimes the Staples dots don’t stick well in the cold & high humidity on the NRA target paper. My name is Scott, and I’m the owner of Label Outfitters. We definitely appreciate the nice article which mentions our labels, and we’ll be more than happy to help with any target labels anyone needs. We are avid target shooters here as well, and I regularly shoot both USPSA pistol matches as well as NRA Highpower matches. You’ll find everything from small 1″ fluorescent target dots all the way up to 6″ and 8″ white target circles, which can be printed or which I use to simulate plate racks when I practice. I would like to offer a special discount code to members of accurateshooter.com. The coupon code is “accurateshooter”, and it will give a 10% discount on anything purchased from our website. I’ve set it up to be valid throughout 2014.